It’s only been less than 2 weeks since the release of the Apple iPad in the United States and Apple stores in Saudi Arabia are already selling the iPad. As far as we know Itechia started selling them last Thursday. 4,999SR ($1,333) for 64GB iPad WiFi. Itechia updated their prices: 2,949SR ($786), 3,449SR ($919), 3,949SR ($1,053) for 16, 32, 64GB iPads. Extra, a store listed on Arab Computers site is also selling the 16GB iPad WiFi for 3,999SR ($1,066). iSTORE (an empty website) has advertised on today’s Riyadh newspaper. It only had a price list: 16GB for 2,999SR ($799), 32GB for 3,499SR ($933) and 64GB for 3,999SR ($1,066). I have called 2 of the 3 Riyadh branches. One of them told me they sold out of 32 and 64GB models. The other branch was honest and told me they only brought the 16GB model. This photo was taken by Turki. 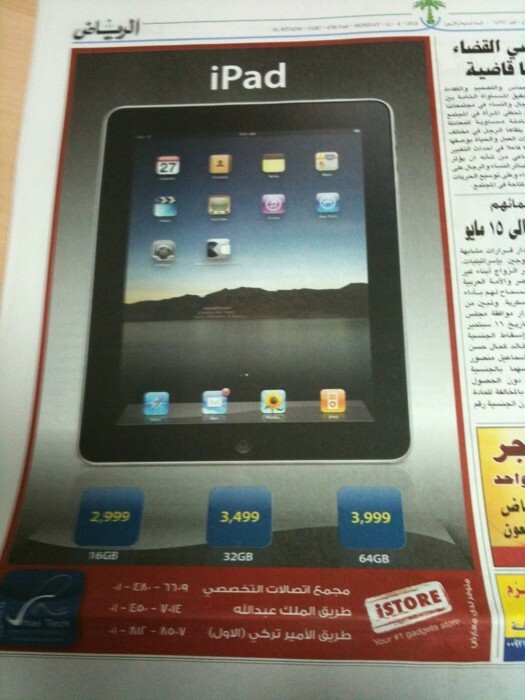 Thanks SaudiDent for updating us about the price of the iPad from I-WEAVER in Jeddah. 64GB iPad WiFi for 5,900SR ($1,573) and they only had 3 units. Officially the iPad should be released by Apple in the following countries by the end of April: Australia, Canada, France, Germany, Italy, Japan, Spain, Switzerland and the UK. Make sure to read the first iPad review in Saudi Arabia. crooks bgoowa i called istore they dont sell 32 & 64 only 16 and sold out who is running apple stores in KSA ??? what about the iPhone … !!! I bought my iPad from IZONE 64gb for $4,950 and I was the 7th person to buy it in Saudi. I know this, because IZONE was the first company here to sell it! Waay before iTechia and the rest of the stores. This is a FACT, not a rumor. lol. Having just moved Saudi from the UK, I find it interesting that this “neutral”?? site happens to have alll the information from Itechia! Pics, they sponsor the site etc etc. Yet, no mention of the store I visited! apparently its also an APPLE Premium Reseller which iTechia and I-weaver arent! I think a store called iSTYLE is also an APR in the country. I went their first, and they didnt have anything. They told me about iZONE. Thought I’d give my two cense worth! I enjoyed the store very very much, and fantastic prices and amazing accessories. Now that I got that out the way, i was wondering now that i have the iPad, where and when i will be able to use arabic on it? they actually take their time and tell us via email or on the facebook page. Did you really pay $4950 ?? or 4950SR? in either case, ÙˆØ´ ØªØ­Ø³ ÙÙŠÙ‡ ? i weaver posted their updated prices here as well, iStyle updated me on their status and I updated accordingly. iZONE never contacted us, and I don’t think they are in Riyadh. hahaha… good one Khaled!!! I def didnt pay that in dollars!! they arent in riyadh actually. but when i visited their site, which was being updated, it said they’ll be opening their largest store next month in Rio. But not sure ill be visiting rio anytime soon. Jeddah is so far ok! I heard Rio is a lot different… ie. the culture and people. What did you write in Arabic btw? didnt understand. either way, thanks. its nice to see a good site mac related. oh I forgot. IZONE where and are still selling all models of the iPad. I dont know the prices for the others since i didnt bother asking. I HAAAD TO get the 64gb!! I need one 64 GB in Jeddah …how to contact you ? i would like to buy a 32 gb let me know price and where are you because i am in jeddah. ,azhar call me if you got my number otherwise e-mail me i will reply you tc. how do i contact muslim traders? r they reliable? i need an ipad, but from reliable sources. update for you all. 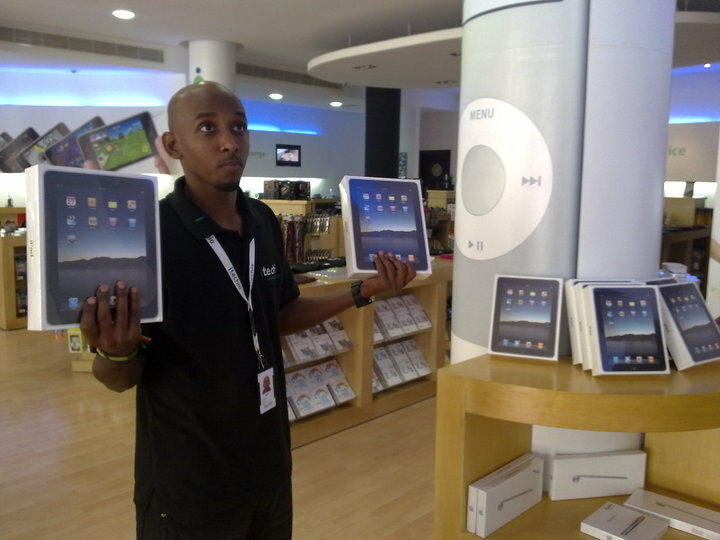 extra stores is selling ipads for only sr 2799. they’ve come down intheir prices, lets wait and watch. maybe prices will come down in other stores also. 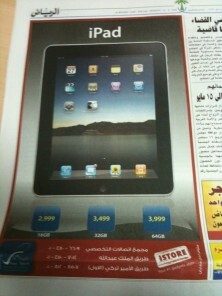 jarir has come down in ipad price from 3000 sr to 2599sr. now, fahad, how much for ur 32 gb? now u have competition? i need IPAD 64 GB 3 G in jeddah..who have it ? wat about the 3g one ??? is available yet ??? DAMN im so tired of searchin it everywhere in jeddah city…. everytime i call itechia or jarir or any electronics store they just told ” AFTER 2 WEEKS THE 3G ONE WILL BE AVAILABLE “. and its like a month now i didnt found it…. thx alot,,, i jst registered there…. actually it’ll be better if its negotiable……. okaaaay,,,,then how much would it be??? and wat do u mean u can have someone give it to me in jeddah ???? where are you anyway??? if u can do it than it’ll be great……. My brother is in Jeddah, I might be able to send it him and you could meet him in Red Sea Mall. The price I am asking for is 4,500 SR. My phone number is 0506694969.
okay,, ill call u by tomorrow…..
but,, may i know wat time can i call u ??? Guys all is apple warranty for one year. Jarir isn’t authorized. No authorized iPad arrived in Saudi Arabia until now. interesting, I have to check them out. I dont know if anyone noticed… but huuuge news.. it seems APPLE is finally doing something about the shady guys like Itechia, Iweaver, istore and all the other non official APPLE guys taking down their APPLE signs. Itechia’s sign is down, and istore is down in Riyadh. I wonder if they will take down Iweaver and macit soon. this shows that they are at least making a stand against these guys. especially Itechia with their silly sillllly prices and Obnoxious General Manager! There are high demand on iPad, where there still the price high, and that mean it has powerful usage and good coverage to the users need and necessary.